The genomic diversity of different species within the genus Lactococcus and the relationships between genomic differentiation and environmental factors remain unclear. In this study, type isolates of ten Lactococcus species/subspecies were sequenced to assess their genomic characteristics, metabolic diversity, and phylogenetic relationships. The total genome sizes varied between 1.99 (Lactococcus plantarum) and 2.46 megabases (Mb; L. lactis subsp. lactis), and the G + C content ranged from 34.81 (L. lactis subsp. hordniae) to 39.67% (L. raffinolactis) with an average value of 37.02%. Analysis of genome dynamics indicated that the genus Lactococcus has an open pan-genome, while the core genome size decreased with sequential addition at the genus and species group levels. A phylogenetic dendrogram based on the concatenated amino acid sequences of 643 core genes was largely consistent with the phylogenetic tree obtained by 16S ribosomal RNA (rRNA) genes, but it provided a more robust phylogenetic resolution than the 16S rRNA gene-based analysis. Comparative genomics indicated that species in the genus Lactococcus had high degrees of diversity in genome size, gene content, and carbohydrate metabolism. This may be important for the specific adaptations that allow different Lactococcus species to survive in different environments. These results provide a quantitative basis for understanding the genomic and metabolic diversity within the genus Lactococcus, laying the foundation for future studies on taxonomy and functional genomics. Lactococcus is a genus of catalase-negative, gram-positive, non-motile, facultative anaerobic bacteria that typically inhabit animals, plants, and their related products, particularly fermented products; they are generally considered nonpathogenic toward humans . Lactococcus species have variable and abundant nutritional requirements. They usually grow within a temperature range of 10–40 °C, although some species are capable of growing at temperatures as low as 7 °C over a prolonged incubation period of 10–14 days . Most Lactococcus species can grow in 4.0% (w/v) NaCl; in media, they grow best at pH 7.0 and cease to grow if the pH drops to 4.5 . Lactococcus lactis was the first species in the genus to be identified (by Joseph Lister in 1873) and then it was later renamed Streptococcus lactis . Schleifer et al. defined the genus Lactococcus as distinct from the genus Streptococcus . To date, there are 12 recognized species with four further subspecies in the genus (http://www.bacterio.net/lactococcus.html, December 2016). Some species, especially L. lactis, are important in the manufacturing of fermented milk products and some species produce antimicrobial compounds, such as bacteriocins, nisin, and lactococcin [5, 6], and recombinant proteins . Some probiotic foods contain these species, and there have been more studies regarding the relationships between these probiotic-containing functional foods and the maintenance of human intestinal health [8, 9]. One species, Lactococcus garvieae, is a major pathogen of fish causing fatal hemorrhagic septicemia . However, L. garvieae has also been reported as a common component of fermented dairy manufactured from raw milk [11–14], and phenotypically it is closely related to L. lactis. The number of studies using high-throughput sequencing to study bacterial metabolism, evolution, and speciation within genera has increased markedly with the advances and decreasing costs of sequencing technologies [15–17]. Whole genomic sequences allow reconstruction of reliable phylogenies based on much larger sequence data sets than previously available. This makes it possible to gain an understanding of the genomic diversification of entire genera in great detail . The first genome of a lactic acid bacterium (LAB), L. lactis isolate IL1403, was sequenced in 2001 . Subsequently, there have been increasing reports on whole genome sequences of LAB. However, of the 16 currently recognized species/subspecies in the genus Lactococcus, only seven have been fully sequenced (National Center for Biotechnology information [NCBI]): L. lactis subsp. lactis, L. lactis subsp. cremoris, L. garvieae, L. raffinolactis, L. plantarum, L. fujiensis, and L. piscium [20–23]. With many new species being identified in the genus Lactococcus, a genomic view could provide important information to understand bacterial evolution and adaptation to different environments. Moreover, comparative genomic of species within the same genus can reveal the genomic diversity within a genus and provide insights into how environmental conditions affect the evolution of different species. In the present study, the genomes of ten type species/subspecies in the genus Lactococcus were sequenced. We then used comparative genomic approaches to define the pan-genome, core genome, and unique genes; assess genetic diversity and species taxonomy; infer phylogenetic relationships; and study the mechanisms of carbohydrate metabolism. The ten type isolates of Lactococcus species/subspecies, as defined by the LPSN (http://www.bacterio.net/) were collected from the German Collection of Microorganisms and Cell Cultures (DSMZ; Table 1). These isolates were cultured in M17 broth (Oxoid Ltd., Basingstoke, UK) at 37 °C for 24 h.
Bacterial DNA extraction kits (OMEGA D3350–02) were used for DNA extraction from each isolate according to the manufacturer’s instructions. Quantitative and qualitative analysis of genomic DNA was achieved using electrophoresis on 1% agarose gels and a TBS-380 mini fluorometer (Turner BioSystems Inc., Sunnyvale, CA). Only good quality DNA samples (OD260/280 = 1.8~2.0, >6μg) were used to construct fragment libraries (200 to 300 bp). Carbohydrates fermentation was tested using the API 50 CH systems (Biomerieux, France) based on the manufacturer’s instructions. The ten genomes of the the Lactococcus type species/subspecies were sequenced using an Illumina HiSeq 2000 (Illumina Inc. USA) by generating paired-end libraries. The average length was 300 bp, and 838 Mb of high quality data was generated for each isolate consistent with a sequencing depth of 129- to 388-fold. Assembly of the paired-end reads was performed using SOAPdenovo v2 . The software Gap Closer was used to fill the local inner gaps and correct single base errors (http://sourceforge.net/projects/soapdenovo2/files/GapCloser/). Gene prediction and functional annotation of predicted genes were achieved using RAST 2.0 [25, 26]. The individual genome assemblies were deposited in the NCBI, the accession numbers are shown in Table 2. 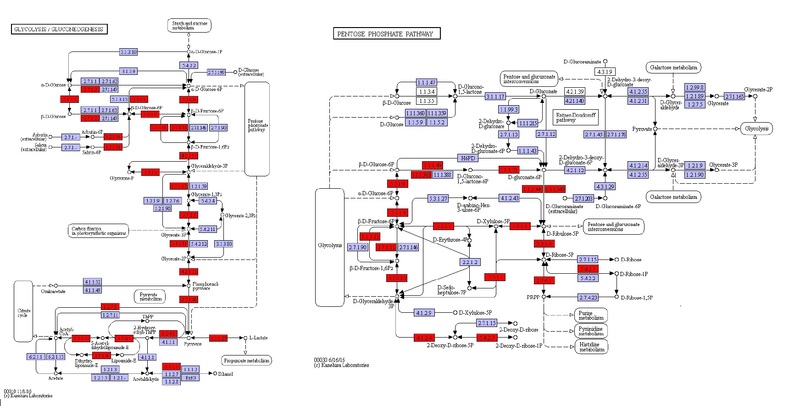 Carbohydrate metabolism related pathway information was identified from the pathways described in the Kyoto Encyclopedia of Genes and Genomes (KEGG, http://www.kegg.jp/) . For predicting the possible dynamic changes in genome size, the sizes of the core genome (common genes, mutually conserved), pan-genome (gene repertoire) and unique genes (specific genes, only found in one genome) were calculated. Owing to large variation were happened in the homologous genes between species within a genus, the concept of ‘gene family’ was used to take the place of the generally used term ‘gene’. According to previous research [28, 29], the core genome, pan-genome and unique genes  of Lactococcus were estimated. A pair of genes was placed in the same gene family, when their amino acid sequences identity was >50%, and when more than 50% of the amino acid sequences of the longer gene could be covered by the shorter one. For construction of the pan-genome, all of the predicted genes were first grouped into possible gene families for each genome and then the gene families of ten genomes were accumulated. The core genome was built by counting the number of commonly shared gene families within ten genomes, while the unique gene family was defined as the gene families that could only be found in one genome. The pair-wise ANI values of ten Lactococcus species/ subspecies were calculated using the methods of Goris et al. . To infer phylogenetic relationships among Lactococcus species, we constructed a maximum likelihood (ML) tree based on the concatenated amino acid sequences of 643 core genes. Streptococcus (S.) thermophilus LMG 18311 was used as an out-group because it is phylogenetically closely related to the genus Lactococcus . Amino acid sequences of the core genes were aligned by MUSCLE v3.8.31 , and the software PHYML was used to construct the ML tree with the WAG model and 500 bootstrap iterations . In addition, a Neighbour-Joining (NJ) tree was inferred based on 16S rRNA sequences downloaded from Genbank for all ten type species/subspecies of Lactococcus using Mega 6.0  (http://www.megasoftware.net) with 1000 bootstrap iterations; again S. thermophilus LMG 18311 was used as an out-group. The estimated genomes of the type isolates of ten Lactococcus species/subspecies were sequenced and assembled into 43–226 scaffolds. Across species, the total genome size varied from 1.99 (L. plantarum) to 2.46 megabases (Mb; L. lactis subsp. lactis), with a mean value of 2.27 Mb (Table 2). In addition, the G + C content ranged from 34.81 (L. lactis subsp. hordniae) to 39.67% (L. raffinolactis) with an average value of 37.02% (Table 2). The numbers of predicted coding genes varied from 1861 (L. plantarum) to 2684 (L. lactis subsp. hordniae). The pan-genome, defined as the full complement of genes from the ten Lactococcus genomes evaluated, contained 8036 gene families and grew continuously as each genome was added; a mean of 662 gene families were added for each genome (Fig. 1a). Compare to the pan-gene families, the amount of core gene families decreased sharply along with the number of genomes increased, reaching a minimum value of 643 for all ten genomes (Fig. 1b). The proportion of core genes varied between 23.9 (L. plantarum) and 34.6% (L. lactis subsp. hordniae) of the total predicted coding genes for the ten Lactococcus species/subspecies. These observations indicated a high degree of genomic diversity among the ten type species/subspecies of the genus Lactococcus. Such genome diversity in the genus Lactococcus is not surprising considering the range of dairy, plant, and animal environments from which the species were isolated. To examine the functional characteristics of the core genes, the Cluster of Orthologous Group (COG) database was used to investigate the distribution of core proteins mapped to each COG category (Fig. 2). There were eight subcategories in metabolism, seven subcategories in cellular processes and signaling, three subcategories in information storage and processing and two subcategories that were poorly characterized. The information storage and processing category accounted for 32.3% of the clusters, and the cellular processes and signaling category and metabolism categories accounted for 17.4 and 29.7% of clusters, respectively (Fig. 2). Furthermore, 18.66% of core genes were belong to translation, ribosomal structure, and biogenesis (J); 7.93% were involved in replication, recombination, and repair (L); and 6.22% were involved in cell wall/membrane/envelope biogenesis (M). Other than the functional subcategories J, L, and M, the 17 remaining functional subcategories included 6–38 core genes. It is notable that most of the core genes played important roles in maintaining growth and reproduction in the genus Lactococcus; these genes are indispensable and constitute the basic framework of the Lactococcus genome. In order to infer phylogenetic position of ten species within the genus Lactococcus, phylogenetic trees were constructed using the 16S ribosomal RNA (rRNA) gene and the concatenated amino acid sequences of 643 core genes from the ten type isolates. The ML tree generated a reliable delineation of phylogenetic relationships across the Lactococcus species, because of more nodes were supported by 100% of the bootstrap iterations (Fig. 3a). According to this highly robust ML tree, the ten Lactococcus species/subspecies were divided into two branches; one branch contained L. raffinolactis ATCC 43920T, L. chungangensis DSM 22330T, L. plantarum DSM 20686T, and L. piscium DSM 6634T, while the other branch included four L. lactis subspecies, L. fujiensis JCM 16395T, and L. garvieae DSM20684T. The topologies of the 16S rRNA gene trees were similar to the ML tree (Fig. 3b). However, the resolution and accuracy of the tree of concatenated amino acid sequences was better than that of the 16S rRNA gene tree. For instance, ATCC 19257T and L. lactis subsp. tructae DSM 21502T, L. lactis subsp. hordniae DSM 20450T and L. lactis subsp. lactis ATCC19435T were clustered closely in the 16S rRNA gene tree and shared > 99.90% identity, but were divided in the orthologous proteins tree. Both trees proved that the ten isolates clustered together to form a single genus. The ANI value is always used to estimate the genetic distance between isolates, which means the sequence identities of the conserved regions between two genomes . The pair-wise ANI values of ten Lactococcus species/ subspecies were calculated to study the interspecies genetic relatedness within the genus Lactococcus. Two clusters formed when the ANI for Lactococcus species was analyzed (Fig. 4). One cluster contained two subgroups: subgroup I (L. lactis subsp. hordniae and L. lactis subsp. lactis) and subgroup II (L. lactis subsp. cremoris and L. lactis subsp. tructae). The 16S rRNA gene identity for the four subspecies was > 99% ; however, the ANI value for this cluster was 86.1–97.9%. It is worth noting that the pairwise ANI values between the two subgroups range from 86.1–86.5%, below the recommended 95% threshold value for species circumscription . To further determine the relationships between the four subspecies, we performed additional comparative genomics with 15 genomic sequences of L. lactis subsp. lactis and L. lactis subsp. cremoris from NCBI. The ANI value distribution of Lactococcus is shown in Additional file 1: Table S1, and the heat map was built based on pairwise ANI values (Fig. 4). Based on these results, the four strains were clearly divided into two subgroups, and these values were in line with the DNA–DNA hybridization results. DNA relatedness values between the type strains L. lactis subsp. tructae and L. lactis subsp. hordniae, L. lactis subsp. lactis, L. lactis subsp. cremoriswere 60, 62, and 90%, respectively . Therefore, we suggest that L. lactis subsp. cremoris ATCC 19257T and L. lactis subsp. tructae DSM 21502T should be separated from L. lactis subsp. hordniae DSM 20450T and L. lactis subsp. lactis ATCC 19435T as a single species on the basis of the genetic distance and the phylogenetic relationships shown in ML tree (Fig. 3a). The other cluster contained six type isolates with 16S rRNA gene identity of 91–97% and ANI of 67.4–85.0%. These are the classical delimitation criteria for different species within one genus. Carbohydrate metabolism plays a key role in the growth of Lactococcus species. On average, 12.5% of the genes in each Lactococcus genome are associated with carbohydrate metabolism. Among the core genes of the ten Lactococcus species/subspecies evaluated, a total of 38 genes (5.9%) were associated with carbohydrate metabolism. The majority were involved in glycolysis/gluconeogenesis and the pentose phosphate pathway (PPP). Twenty-eight key enzymes that contribute to glycolysis/gluconeogenesis and PPP were encoded (Table 3, Additional file 2: Figure S1). Our results indicated that glycolysis/gluconeogenesis and the PPP are the central carbohydrate metabolism pathways of Lactococcus species. In addition, all strains have genes encoding fructokinase (EC 2.7.1.4), phosphoenolpyruvate–protein phosphotransferase (EC 2.7.1.199), and glucose-6-phosphate isomerase (EC 5.3.1.9), which are key enzymes in fructose and mannose metabolism. Thus, all strains could ferment d-glucose, d-fructose, and d-mannose (Table 4). Pathways enabling the use of l-arabinose, l-sorbose, l-rhamnose, xylitol, d-lyxose, and d-tagatose as energy were not found in the genome sequences of the ten strains examined. Some differences in carbohydrate metabolism genes were also found among the ten Lactococcus species/subspecies. The number of carbohydrate metabolism genes in the ten species/subspecies evaluated varied from 194 (L. plantarum DSM 20686T) to 366 (L. lactis subsp. tructae DSM 21502T). Pairwise comparisons among the ten Lactococcus species/subspecies showed that the number of strain-specific carbohydrate metabolism genes varied between 2 and 15, and appeared to reflect the functional diversity observed for each isolate. To detect differences in functional genes related to carbohydrate metabolism, acid production from carbohydrates was tested using the API 50 CH system (bioMérieux, Inc., Marcy l’Etoile, France) (Table 4). Raffinose can be enzymatically hydrolyzed to melibiose by β-fructofuranoside (EC 3.2.1.26), and melibiose is further hydrolyzed to d-glucose (α-galactosidase; EC 3.2.1.22), and enters the glycolysis pathway. Three strains, L. lactis subsp. tructae DSM 21502T, L. piscium DSM 6634T, and L. raffinolactis ATCC 43920T, can utilize raffinose and melibiose, because they possess the key enzymes (EC 3.2.1.26 and EC 3.2.1.22) for raffinose and melibiose metabolism, while L. plantarum DSM 20686T, L. lactis subsp. hordniae DSM 20450T, and L. chungangensis DSM 22330T with β-fructofuranoside and no α-galactosidase, cannot utilize raffinose and melibiose. Furthermore, β-fructofuranoside is a key enzyme for sucrose hydrolysis, and so the four strains lacking this enzyme cannot utilize sucrose. The other six strains can hydrolyze sucrose to d-glucose-6P and d-fructose. The role of L. lactis as an important industrial starter strain is mainly due to the rapid conversion of lactose to lactic acid. Lactose is hydrolyzed by β-galactosidase (EC 3.2.1.23) to give α-d-glucose and d-galactose, and it can also be catalyzed to lactose 6-phosphate (Lac-6P) by lactose phosphotransferase (EC 2.7.1.207). Lac-6P is subsequently hydrolyzed by 6-phospho-β-galactosidase (EC 3.2.1.85) to give galactose 6-phosphate (Gal-6P), and Gal-6P is catabolized by the tagatose 6-phosphate (Tag-6P) pathway [37, 38]. Comparative genomic analysis showed that most strains have the key enzymes for lactose metabolism, with the exception of L. chungangensis DSM 22330T, L. fujiensis JCM16395T, L. plantarum DSM 20686T, and L. lactis subsp. tructae DSM 21502T. These four strains lack lactose phosphotransferase and β-galactosidase, but L. lactis subsp. tructae DSM 21502T and L. fujiensis JCM16395T could utilize lactose in the API 50 test (Table 4). Therefore, we inferred that they have additional pathways for lactose metabolism. Ribokinase (EC 2.7.1.15) is the key enzyme in d-ribose metabolism. L. raffinolactis ATCC 43920T, L. plantarum DSM 20686T, L. lactis subsp. hordniae DSM 20450T, and L. chungangensis DSM 22330T have no genes encoding ribokinase, so they cannot utilize d-ribose. It is considerable realistic significance for applying Lactococcus strains to systematically analyze the evolutionary history and phylogenetic position of the Lactococcus species/subspecies. Therefore, we completed the whole-genome sequencing of ten type strains in Lactococcus genus to assess their genomic characteristics, metabolic diversity, and phylogenetic relationships. Across ten Lactococcus species, the total genome size varied from 1.99 (L. plantarum) to 2.46 Mb (L. lactis subsp. lactis) (Table 2). The genome size of the Lactococcus species evaluated was relatively small compared with other LAB genera, such as Enterococcus (2.31–5.27 Mb) and Lactobacillus (1.23–4.91 Mb) . A smaller genome size was suggested to indicate adaptations for reproductive efficiency or competitiveness in new environments . The G + C content of 10 strains ranged from 34.81 (L. lactis subsp. hordniae) to 39.67% (L. raffinolactis). The G + C content of genome is influenced by selection and mutation involving multiple factors, including the symbiotic lifestyle, environment, nitrogen fixation ability, aerobiosis, and how the polIIIa subunits are combined . In addition, analysis of the trends in pan-genome size of Lactococcus species/subspecies proved that Lactococcus genus has an open pan-genome. This may be associated with the range of environments colonized by different Lactococcus species and the existence of numerous ways of exchanging genetic material. Previous reports showed that bacterial genomes change when they adapt to variable conditions, and that greater niche diversity requires larger pan-genomes . Currently, the 16S rRNA gene sequencing technique and genomic DNA–DNA hybridization are considered the gold standards for identification of isolates at the species or genus level. However, because of conservative property, 16S rRNA gene could provide sufficient resolution at the species levels [42, 43], and DNA–DNA hybridization is rather time-consuming and labor-intensive. With advances in sequencing and computational technologies, the combination of core genome phylogeny and ANI values could provide accurate taxonomic guidance for LAB based on whole-genome sequences . The lowest value for the Lactococcus genus was 67.4%, while the highest ANI value was 97.9%, revealing that the genomic sequence identities between different pairs of species had marked differences. The ANI values were mainly distributed in the region of 67–68% (Additional file 1: Table S1), while the distribution of Bifidobacterium genus was concentrated in the region of 71–74% . These results suggest that the majority of sequence identities between Lactococcus genomes were low, only slightly higher than those between species from different genera. This could be used as a reference characteristic for identification of Lactococcus species. Differences in carbohydrate metabolism genes among the ten Lactococcus species/subspecies showed that each could utilize various different carbohydrates. One interesting application of comparative genomics is the identification of associations between strains and their origins. Previous studies using comparative genomics in the genera Nocardiopsis  and Bifidobacterium  demonstrated specificity to particular ecological niches. In this study, the genotypic and phenotypic carbohydrate metabolism analyses suggested that the lactococcal species may correlate with respect to their origins, but regularities were not found. This is probably due to the unequal and small numbers of isolates from different origins. Three species were isolated from milk and four species from fish, bovine, and leafhopper, whereas only two species were isolated from plants and one species from activated sludge foam (Table 1). As more species are discovered from different countries and origins, further genomic evidence may become available for the genus Lactococcus, which would provide strong indications of the factors that have affected its evolutionary history. The majority of the carbohydrate fermentation results are in accordance with the metabolism pathway predicted by the genome sequence, but some differences were also detected, for which there are at least two explanations: predicted gene function based on sequence data is not completely accurate, and the pathways of carbohydrate metabolism are not yet well understood in KEGG. In the present study, ten type isolates of species/subspecies from the genus Lactococcus were sequenced and analyzed. Comparative genomic analysis revealed that species in the genus Lactococcus had relatively small and diverse genomes. The high degrees of diversity in genome size, gene content, and carbohydrate metabolism may be because the isolates originated from a wide range of host types and ecological niches. The genus Lactococcus has an open pan-genome, and thus the size of the pan-genome is as yet underestimated and will increase as additional isolates and species are sequenced. Since we had only a limited number of isolates, gene evolution in the genus Lactococcus was not analyzed. Nonetheless, this study provided insights into genomic and metabolic diversity and phylogenetic relationships of the majority of type species/subspecies in the genus Lactococcus, which will lay the foundation for future studies of their taxonomy and functional genomics. The authors are indebted to the members of the Key Laboratory of Dairy Biotechnology and Engineering, Inner Mongolia Agricultural University, Hohhot, for their technical supports. This research was supported by the National Natural Science Foundation of China (Beijing, China; Grant No. 31622043) and National Natural Science Foundation of China (Beijing, China; Grant No.31601454). The sequence information of ten Lactococcus type species in this paper has been deposited in the National Center for Biotechnology Information (NCBI; http://www.ncbi.nlm.nih.gov), the accession numbers JXKA00000000, JXKB00000000, JXKC00000000, JXJW00000000, JXJX00000000, JXJT00000000, JXJU00000000, JXJV00000000, JXJZ00000000 and JXJY00000000. JY and ZHS designed the experiments. YTQ and YR performed the experiments. YQS and WJL analyzed the data. JY drafted the manuscript. All authors read and approved the final manuscript. The Ethical Committee of the Inner Mongolia Agricultural University ruled that no formal ethics approval was required for this study. Lorca G, Reddy L, Nguyen A, Sun EI, Tseng J, Yen MR, Saier MH, Milton H, Saier J. Lactic acid bacteria: comparative genomic analyses of transport systems. In: Mozzi F, Raya RR, Vignolo GM (eds) Biotechnology of lactic acid bacteria: novel applications. Oxford: Wiley-Blackwell. 2010. pp. 73–87. doi:10.1002/9780813820866.ch1.